A typical Super Sparkle concert is closer in spirit to a party than your standard rock show. The band's eight members, two of whom are energetic backup dancers, crowd the stage. They're often wearing matching ensembles, and they're usually surrounded by a halo of confetti, streamers or twinkling lights. If you've ever seen them live, you'll know that the good feelings they generate are pretty damn infectious. "Each time we play, you're going to get something a little bit different," says Karli Ingersoll, one of the band's guitarists and vocalists. "It's not going to be the same set. It might not even be the same people every time. We have different dress codes we cycle through. "You're not going to regret it if you come to every single show we play, because we're going to make it really fun." Super Sparkle has been performing since the spring of 2016, and they're something of a local supergroup, featuring musicians who are involved in projects like Cathedral Pearls, Water Monster, Windoe and Mama Doll. Ingersoll started the band, and is one of three primary songwriters and vocalists alongside keyboardist Max Harnishfeger and guitarist Scott Ingersoll (her brother-in-law), who also performs locally as Scott Ryan. The trio is joined by bassist Adrian Saludes, drummer Claire Fieberg, saxophonist Caleb Brown and choreographed dancers Jen Landis and Darrien Mack. "The [original] idea was that it'd be a rotating cast," Ingersoll explains. "You'd have a set of songs, and people would cycle in and out, and anyone could play the parts. So it'd be kind of like a surprise when you'd show up." 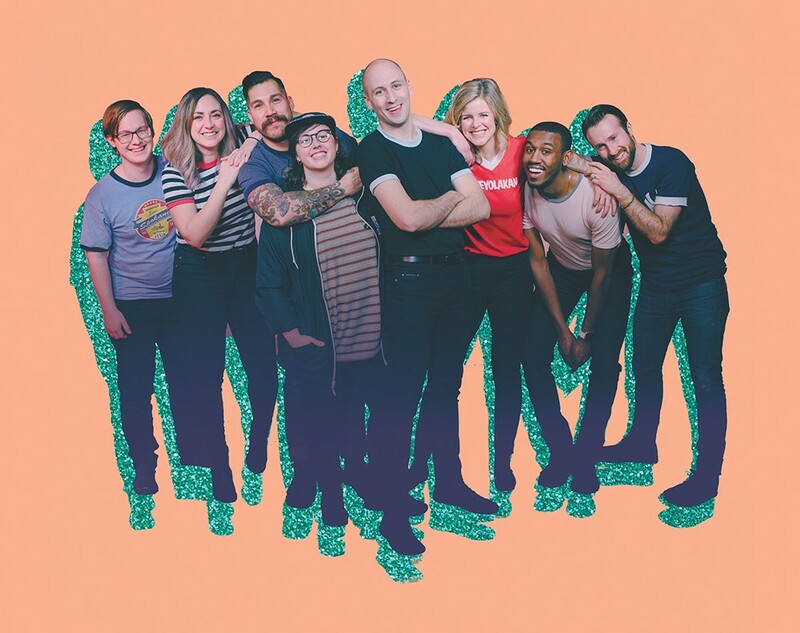 The band's core lineup has been more concrete than that, but that sense of spontaneity — the idea that no two Super Sparkle shows are totally alike — has become the group's driving principle. Consider their upcoming show at the Washington Cracker Co. Building, where they'll be joined by longtime Spokane Symphony percussionist Bryan Bogue and a small string section on a handful of songs. If you're familiar with its members' other projects, Super Sparkle's music might not be what you expect the first time you hear it. It's inspired by buoyant 1960s pop and soul, and the classic grooves of Motown, a slick mix of sugary harmonies and catchy melodies. There was initially talk of the band itself employing simple choreography to match the music, similar to the moves pulled by old doo-wop groups, but that task was eventually doled out to Landis, who then recruited Mack. "[The choreography] is extremely collaborative," Mack says, explaining that he and Landis spend hours standing in front of mirrors and working through their routines. "We have tiny movements for each song, and then we bring that together and flesh it out. ... We're listening, thinking, 'What would we naturally do?' and put that into something that's synchronized." Certainly it's the band's live energy, the kind that makes it easy to dance along to, that has resulted in their local popularity. They've sold out several shows at the Bartlett, including two nights in a row on the most recent New Year's weekend. And they've already recorded a self-engineered EP, filmed music videos and have a batch of new songs that will be released over the next couple months. "It's really easy to connect to [the music] and relate to it, and I think that might have to do with how quickly the following came," Harnishfeger says. "We're not trying to challenge or push any buttons, and just trying to make people happy." "We're all friends and we hang out," Saludes says. "We're not just this band that's coming together to play songs. We actually hang out with each other. I think that joy manifests itself in the music, too." And now the band is set to play their first out-of-town shows — at Boise's Treefort Music Festival in late March, and in April at the Sunset Tavern in Seattle. There are obviously complicated logistics and coordination involved when your band is an octet, but there are certain benefits of having so many members: Super Sparkle's collaborative process has been easier than expected, likely because they have more people to bounce ideas off of. Even the band's most seasoned players admit they're somewhat taken aback by how effortlessly the music has come to them. It's chemistry, and it's right up there on the stage. "For a lot of us who have played for a long time in different groups, everybody looked around and was like, 'This feels too easy, putting these songs together,'" Ryan says. "Everybody was quickly on the same page about what the band was. If that's not carrying over to the live show, something's not right." The original print version of this article was headlined "All That Glitters"